As I focused on "Putting Kids in the Same Boat" this week, I realized the importance of understanding the Mistaken Goal Chart which can be found on the Free Downloads page of positivediscipline.com. 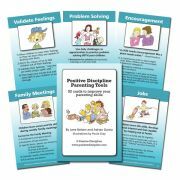 As you read over this chart pay particular attention to the column that lists how the parent is feeling. You'll begin to notice that kids are often acting out on those mistaken goals. That doesn't necessarily make it easier to deal with, but it can help you get into the child's world. In my case, I have been feeling ANNOYED!!! I even talked about this with my kids. The interesting part about this past week was that the kids kind of took pride in the fact that I wasn't going to get involved in their disagreements. They sort of teamed up and put more energy into proving that they could handle their own problems. A couple of times my daughter made a point of telling me "It's okay dad, we were just playing." Brad, thanks for the reminder about the mistaken goal chart and the link to the downloads. I sometimes forget about the mistaken goals but it really is valuable information. It's pretty easy to figure out our feelings in a certain situation and go from there. I think I'll print out the sheet so it's handy!